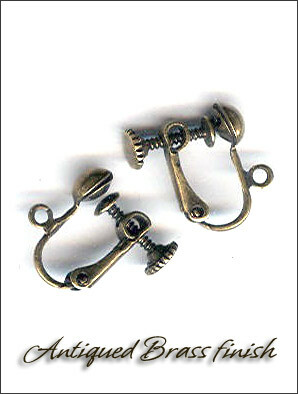 Features: Antique Brass screw back clip earring findings. These clips are hard to find, they have a lovely antique brass look that is superb to match and fix/restore, make your own antique vintage earrings. It is also fabulous for bohemian earring styles. Beautiful antiqued brass hue with screw back to control the level of pressure to the earlobe. Adjust the pressure once with the screw backs and then used the hinged backs to open and close the earrings. It is that easy!